Avoid exercises/sports that may lead to abdominal injury or include a high risk of falling such as horseback riding, diving, bungee jumping, rollerblading, gymnastics, downhill skiing, snowboarding, ice-skating, strenuous racquet sports, cycling, and contact sports such as ice hockey, soccer, or basketball. Avoid exercises that include lying on your back after the first trimester, since the position could bring about the bulk of your developing uterus to constrict significant blood vessels and limit blood flow to you and your baby, while making you feel queasy, giddy, and short of breath. Avoid exercises that involve advanced stomach moves like full sit-ups or double leg lifts, which can cause the abs to partition from the midline and even tear. Avoid backbends or other contortions, and also movements that include profound flexion or extension of joints (like profound knee bends), which can make you prone to danger. 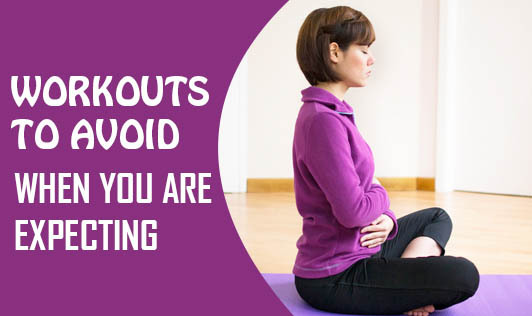 Avoid exercise which involves extreme or bouncy stretching— since your ligaments are as of now looser, pregnancy isn't the ideal time to force a split or advance your yoga rehearse. Your center of gravity has shifted which may affect your balance and coordination, making you more susceptible to injury. In case something hurts, stop! Avoid scuba diving, which can cut off oxygen supply to the baby. This is because scuba divers need to decompress as they return to the surface of the water. The developing fetus may have difficulty decompressing and this may lead to birth defects and preterm births among expectant moms. Avoid exercises that involve holding your breath — both you and your baby need a constant flow of oxygen. Avoid exercises that comprise of motionless standing after the first trimester as it can restrict blood flow. Avoid these movements in yoga (like tree, or extended hand to big toe) and tai chi. Stay away from hot yoga or exercising in super-hot weather as it can raise your body temperature excessively, which forces the blood flow away from your uterus to your skin as your body attempts to cool off. Apart from all these exercises which warrant restrictions, it is important to visit your health care provider to discuss your situation and evaluate together what activity is safe for you to engage in during your precious 9 months.